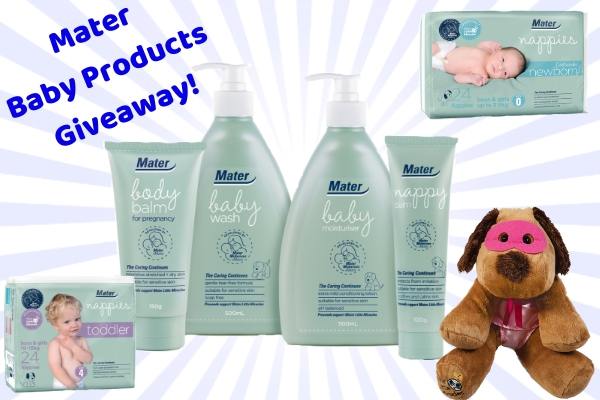 Away From Blue | Aussie Mum Style, Away From The Blue Jeans Rut: Mater Baby Products Hamper Giveaway and Discount Code! What a wonderful giveaway! Thanks for sharing. This is awesome. I hope the giveaway is international. What a fun giveaway! Also interesting to see what brands you have that we don't have in the states! Hope you are having a great week, Mica! What a great giveaway! These products sound so good! Such an awesome giving away. great giveaway for mommies:)! These Mater products for babies seem wonderful. I am interested in the Mater baby wash please. My bubs toosh constantly red, inflamed and her little knees!! Sounds like a great giveaway for new mamas and mamas-to-be! What a great giveaway. Yesterday we had a party shower for a coworker who is going to have a baby. She got some great things. The moisturiser to keep my little niece hydrated and baby smooth! I'd love to try out the nappy balm, perfect for those sensitive bums i'd trust Mater over other brands! Very excited to try the Mater Body Balm for pregnancy! Our 1st bub is on it's way and were very excited for the journey ahead! I would be really keen to try the nappies!! Great giveaway, nappies in our house are a big factor, would love to try these ones. I would love to try the Nappy balm for my niece to help soothe and prevent nappy rash. Looking after our amazing Bodie she is important too! Love to try the Matters Nappy Balm. A red bum isn't fun! Mater Baby Moisturiser would be my choice, to bond with baby and massage its little body. I'm all for products free from petrochemicals and parabens, and Mater ticks a lot of boxes! What a fabulous giveaway! I actually love their moisturizer. Nappy balm. Always on the lookout for products that keep nappy rash at bay. I would like to try the baby wash products for my new grandchild coming this May of 2019. I’m excited to try out the nappies - I’ve heard such great things about the Mater nappies and it’ll be perfect timing with my first Bub arriving any day now! We love the mater baby wash, it smells amazing! And that is why I'd love to win! Body Balm for Pregnancy! To keep the stretch marks at bay and make the soreness and itching go away! As stretch marks for years won't be fun! Baby Moisturiser... Just what I need for a babe with sensitive skin... Previously I'd used this amazing product personally after a double mastectomy. I would love the miracle max toy to play with my soon to be niece/nephew but I know my sister would love that Body Balm for Pregnancy right now and the rest very soon. Thank you all so much for your entries! The giveaway is now closed, winner will be contacted soon! Don't forget you can still use the discount code! Hi, so sorry, but the giveaway is closed.